This is the next installment (completed) of my PRACTICUM series. 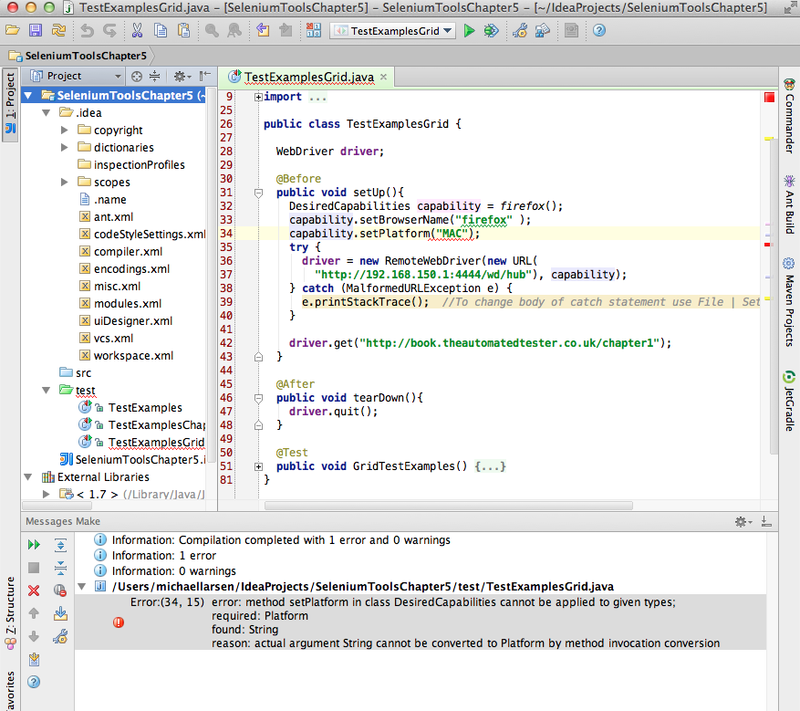 This particular grouping is going through David Burns' "Selenium 2 Testing Tools Beginner's Guide". [Note for 2/19/2013: Compiler errors... no, that will not stand, man! I will get to the bottom of this... and I think I finally have. 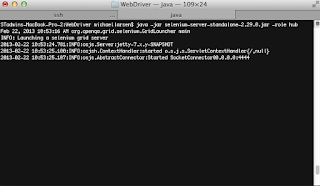 For those who are using Java 7 as your JDK, look towards the bottom, I discovered something that resolved our past compile problems, or at least, I think I have :). --MKL]. One of the nice things I have noticed thus far with regards to the Selenium tests that I have seen is that they are relatively easy to change so that the tests can be run on multiple devices. The down side is that, so far, we have had to run them all one at a time, or switch things over to different servers, different bridges, and check them out one at a time. Also, tests are launched serially and run in order in the approaches we have taken so far. That's all cool, but is there some way that we could simplify things and just have one place we could focus our attention? The answer is "well, almost!" 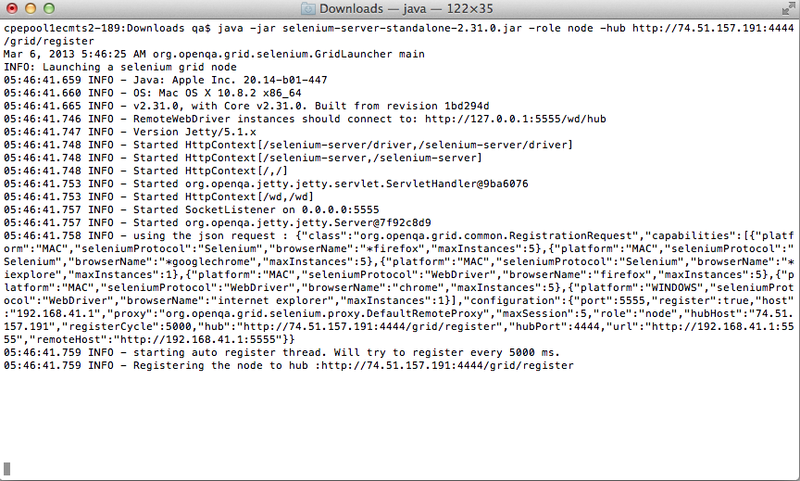 Selenium Grid lets us set up a number of Selenium instances, with one central "hub" to send commands to. Selenium Grid routes the commands destined for a particular device or driver based on the configuration options and identification elements we create. While it's not an "all in one" solution, it's a nice way to go about gathering a lot of tests under one roof and varying the ability to test lots of different devices. 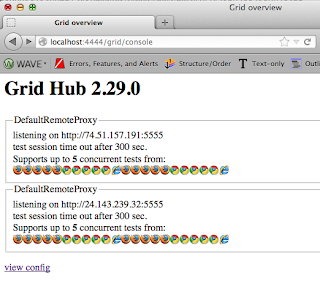 First, though, we need to set up our environment to allow for a grid server. 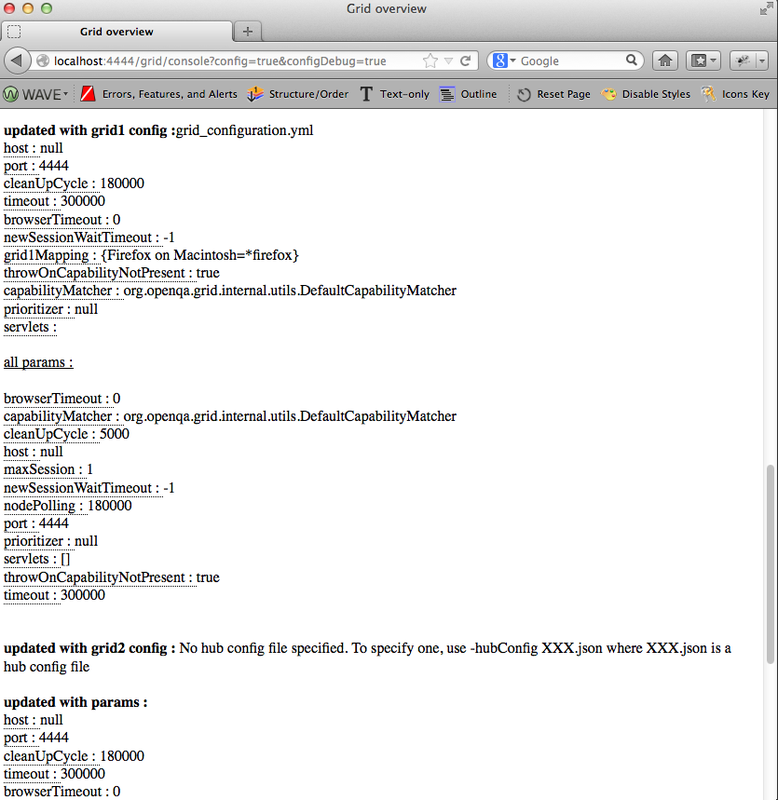 And here's what your browser will say if you point to the server. 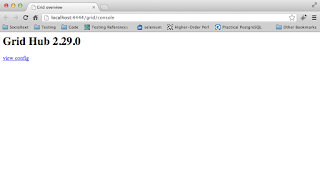 Cool, we've successfully started Selenium Grid. All looks good here. 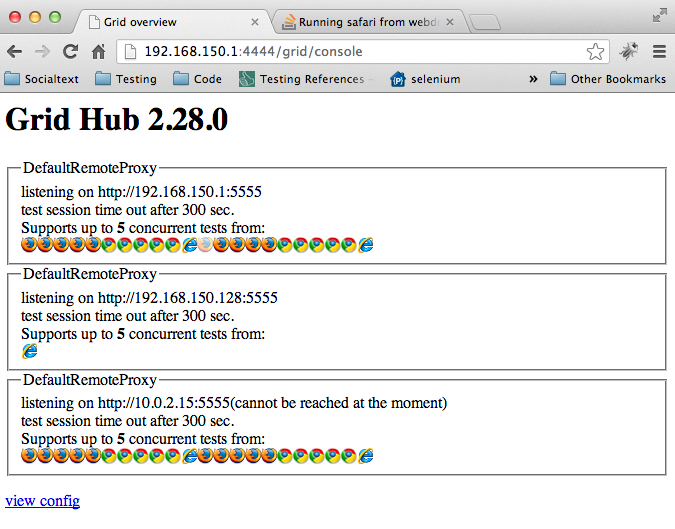 This is going to be the center point of our tests, and other Selenium instances will be reached from here. 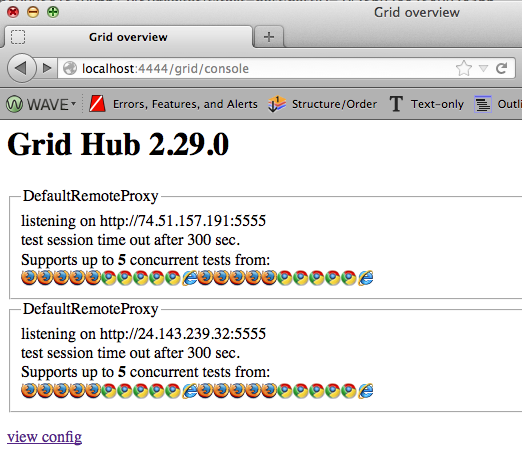 When we start Selenium Grid, we can see what options we have control over and which ones we can change. By passing in the port number (i.e. 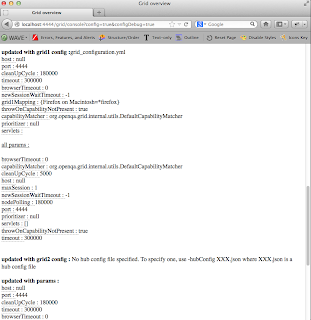 –port ####) We can use any value that we want (and have access to, of course). 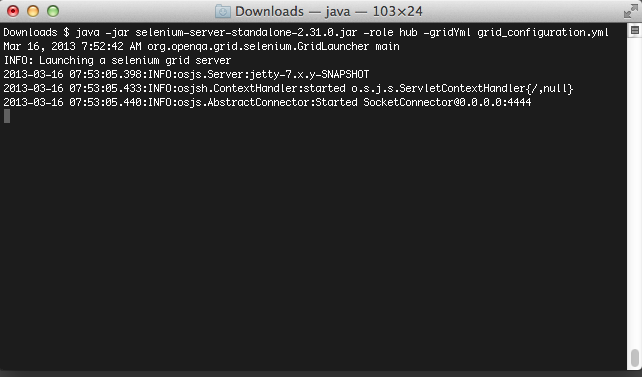 This time, we'll look at starting up Selenium Grid, as well as starting up a second Selenium server. Cool, so if we did that all correctly, we should have a grid with three registry entries... do we? 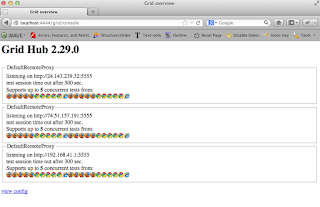 If we only needed to run on one browser and one operating system, this would be a much easier situation to deal with. 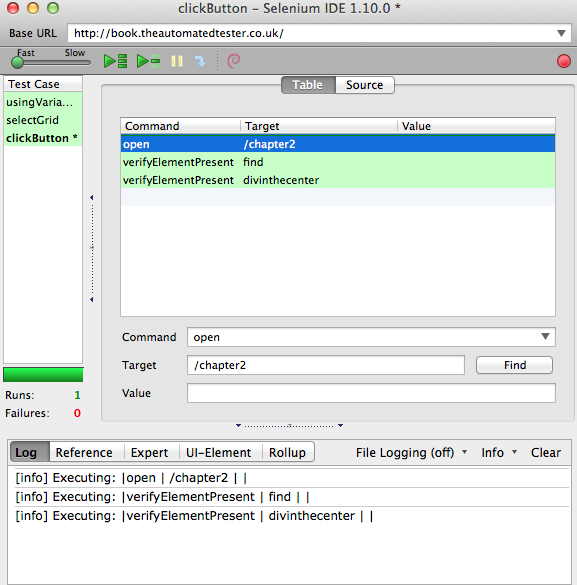 In that case, much of Selenium Grid would be to merely provide for parallel tests and pointing to different instances of Selenium Server, all utilizing the same browser driver. While that's probably OK in some instances, most of us have to deal with situations that require a variety of browsers. More to the point, we don't have to just consider issues of browsers (Chrome, Firefox, Opera) in their own rights, we also have to consider the challenges of running them in a variety of Operating Systems (Windows, Mac, Linux, etc.) Even with Internet Explorer being solely on Windows, there are now multiple versions and multiple OS considerations (XP, Vista, 7, 8). 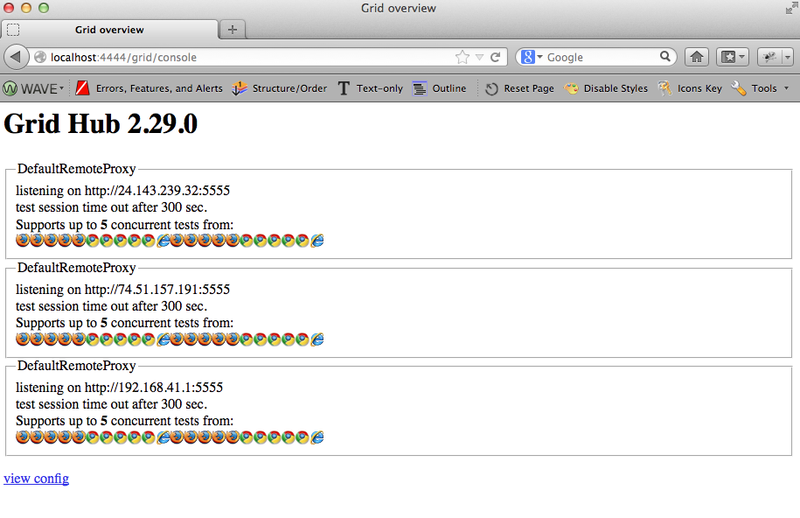 Safari runs on Mac, and we haven't even started talking about Mobile yet! 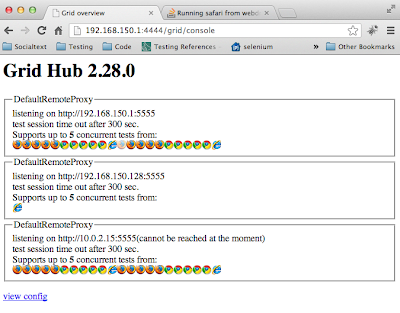 Selenium Grid, in a manner of speaking, gives us "One Ring (Hub?) to Rule Them All!" Well, OK, perhaps not all, but there are nine options that we can leverage at this point. Not sure if that's going to make a big difference, but suffice it to say, we're running with the parameters the book told us to run. In our later tests, we'll see if they run correctly. There are two different configuration options that are available. 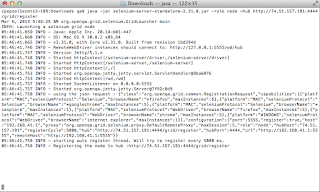 If you have Selenium 1 Gris servers (i.e. 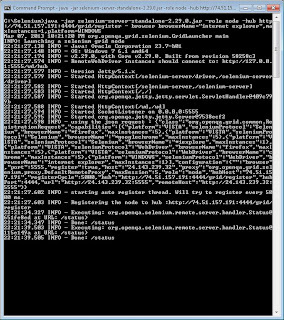 Selenium RC) and you want to run them along with the more up to date Selenium2/WebDriver servers, you can. 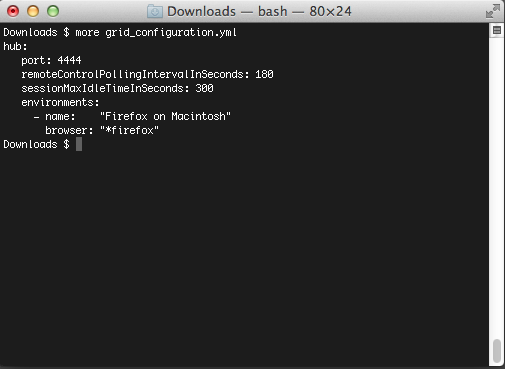 Define the details you want to configure in the YAML file, and when you start up the Grid hub, give it the flag -grid1yml and the name of the YAML file, and you're good to go. Up to this point, I have to say that my update speed has been very slow with this chapter. That's been a combination of work conspiring against me, plus some unusual issues with getting files to compile that made me decided that I had to get to the bottom of it. 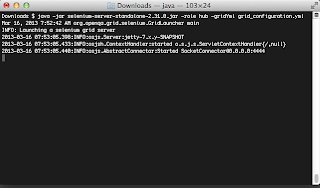 Through that process, i discovered that Java 7 requires a little more verbosity than Java 6 did. I could be wrong about this, but on the bright side, I think I may have found an answer to the issues of not being able to compile in previous sections. 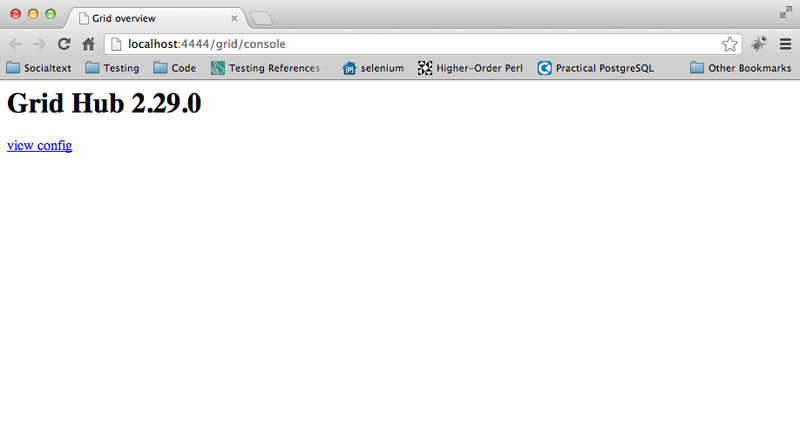 First, let's talk running tests that leverage the grid. This is a simple example, simply because I decided I didn't want to fight multiple machines, multiple drivers, and multiple error messages just yet (hey, I'm having such fun with it, why shouldn't I let you all do the same ;) ?). But, to show that we are actually "gridding" it, here's a simple test that I put together to make sure that it goes to a particular location. 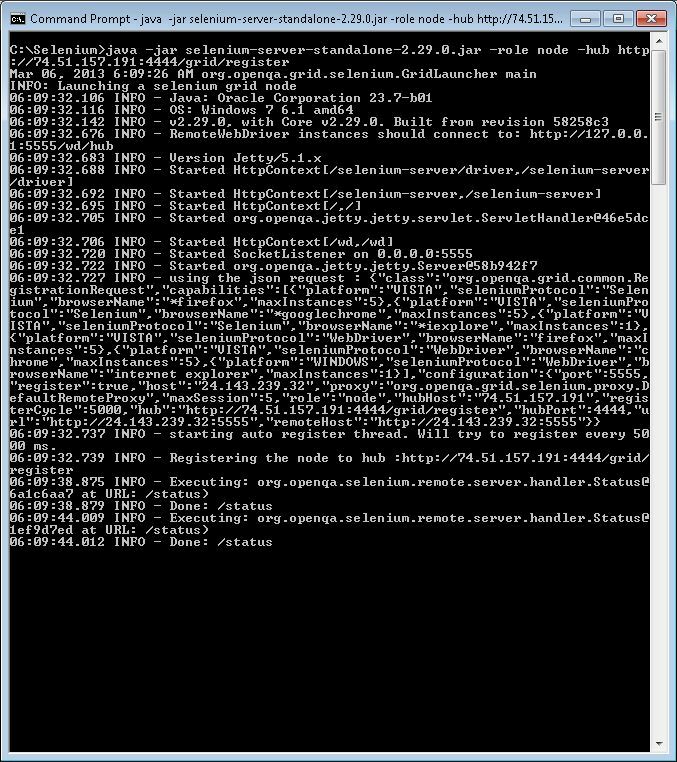 In the example below, I have three servers. One's running on Windows, one's running on Linux and one is running on Mac. 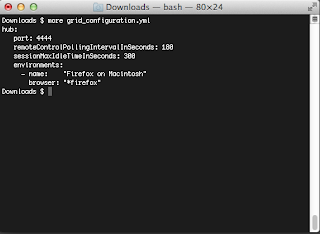 I want to make sure the test in question goes to the Mac instance. 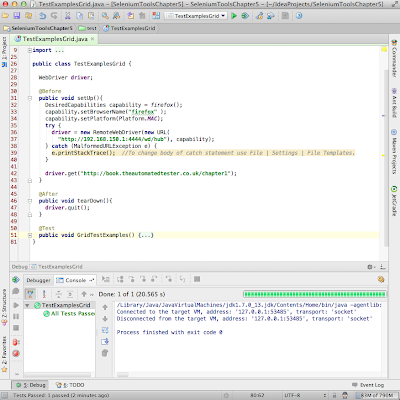 Right, so what's interesting about the above code? Glad you asked. 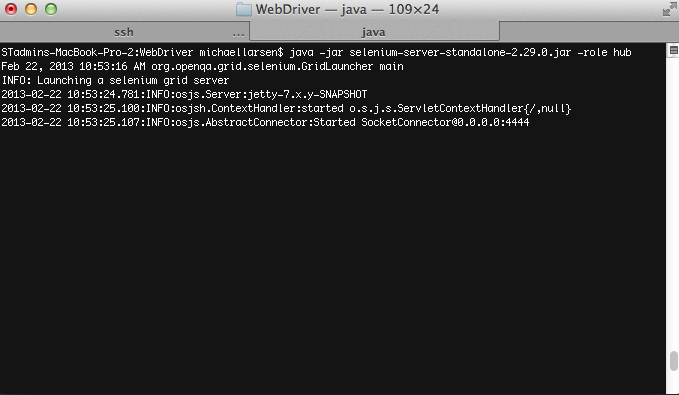 As I was setting this example up, I kept getting the compile error "SetPlatform requires Platform, but found String". Oh, and note... 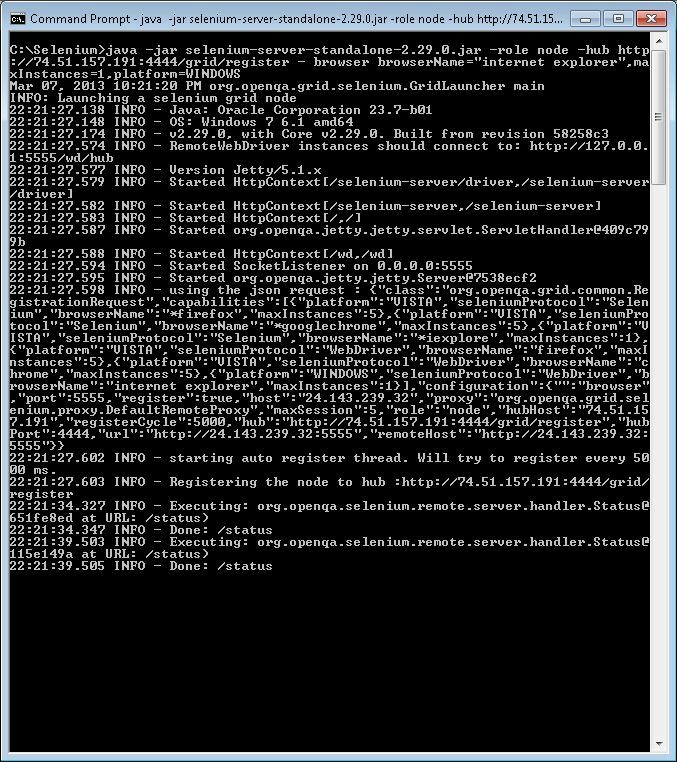 I finally got my Windows Server to declare itself an Internet Explorer only node, so yes, it's doable. 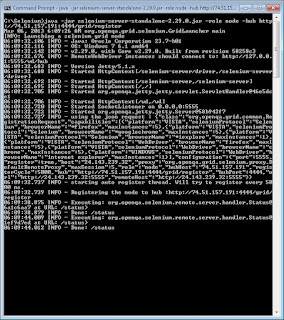 I don't know what I did differently other than have the Windows version run the latest version of Selenium Server... hmmm, that might be it. Yeah, this section took a long time to get through, but on the plus side, I made a neat discovery, and that discovery may go a long way to solving a few other problems. Net result is that I'm going to go back and do some re-testing and re-coding of the previous examples and bring them in line with Java 7 realities. 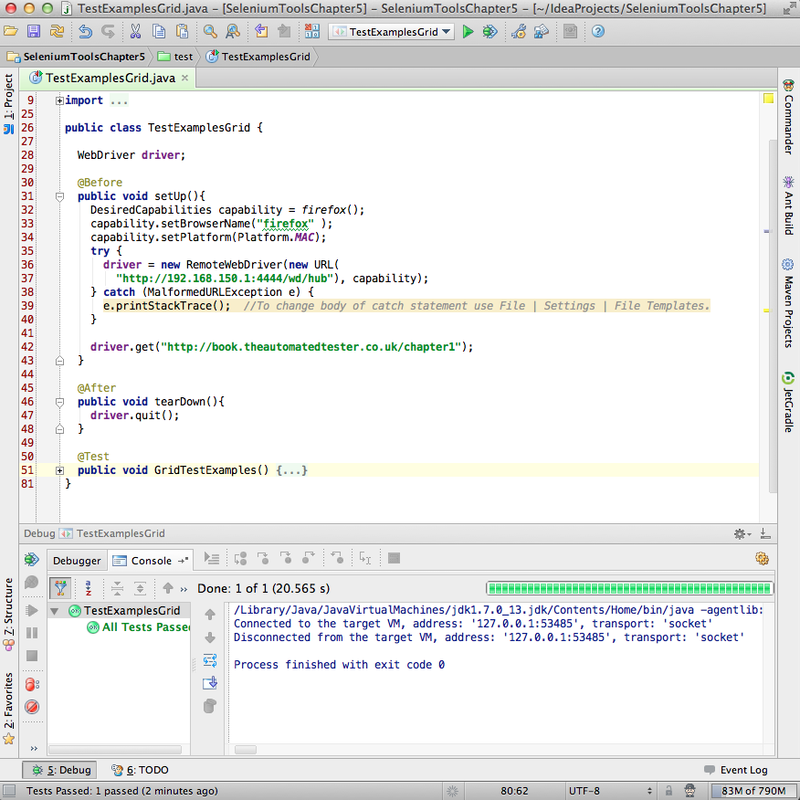 Seriously, I am ecstatic that there is a potential solution to all of the random compile errors, and if it's this simple, then there will be some easy changes to suggest to Packt so that they can perhaps make an update in the errata to reference Java 7 type conversion (or lack thereof :) ).